Designer Alastair Macintosh and engraver Willie Bain have produced a range of artglass and paperweights. The recurring themes for this collection are the use of Her Majesty's much loved pastel colours and the flowers with which we have come to associate her, such as the Elizabeth of Glamis rose and the poppy of remembrance, together with the white rose seen at her funeral. All the paperweights in the range will bear a special Queen Mother backstamp. 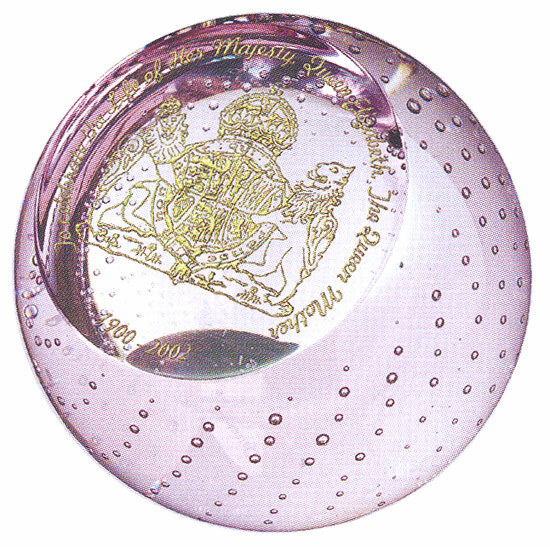 Queen Mother's Arms (standard) The Queen Mother's crest and inscription is engraved onto the front facet of this amethyst coloured paperweight.